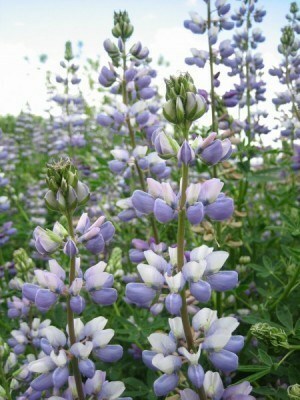 Habit: this lupine sometimes is considered a subshrub, forming a woody base at times. Stems are reddish brown, and leaves are well spaced and composed of 5-9 leaflets. Inflorescence is a large open spike with flowers in whorls. The pea like flowers in streambank lupine are two toned, ranging from purple to creamy white and blooming between May and September. The fruit is a somewhat hairy pod that turns dark as it ages. Ecology: found only in the Pacific Northwest in riparian zones including gravel near marshes, stream banks, and wet to moist meadows, at low elevations more commonly near the coast. Growing Conditions: full sun to partial shade, moist to wet fine textured soil preferring its feet to be wet. Streambank lupine is on the endangered species list in Canada being found only in a few areas, which carry much significance since they are some of the most true populations without influence of hybridization of other species.